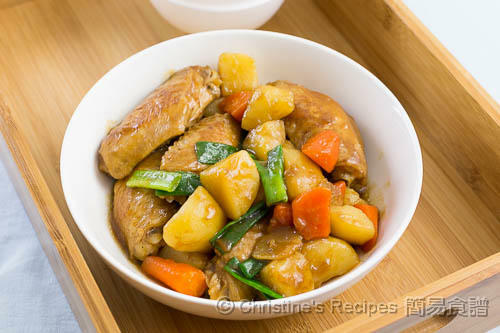 If you’ve lived in Hong Kong for a while, you would’ve known this dish, Braised Chicken Wings with Potatoes, or tasted it before. It’s so homey and tasty dish. I miss this braised chicken wing dish so much. If you’ve lived in Hong Kong for a while, you would’ve known this dish or tasted it before. It’s so homey and tasty. Oftentimes, my mum used to chop the wings into halves when she cooked this dish. I just love every bit of it and don’t want to waste every drop of the sauce, so I mixed it with my bowl of rice. This dish is so easy to make. There is a tricky point though. The potatoes could become quite mushy after braising. 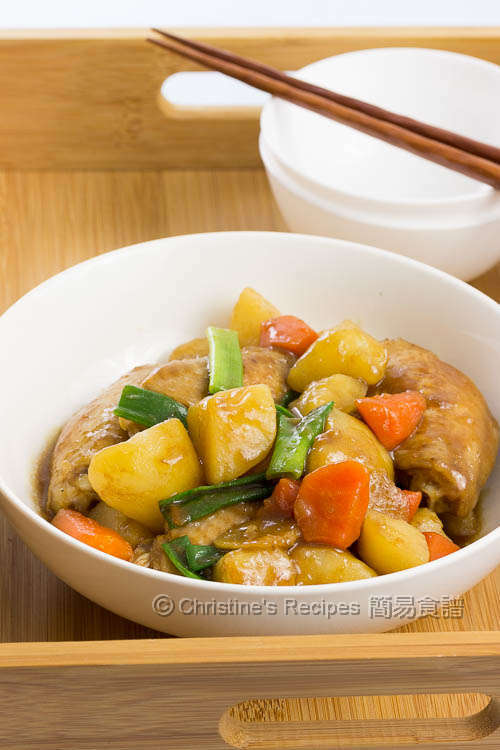 Chefs in Chinese restaurants will deep fry potatoes briefly beforehand in order to keep the shape. In home cooking, we opt for using lesser oil if possible. How to go about it then? I’d share a simple tip below the recipe. If you have any other methods, you’re welcome to share in the comments. Blanch the chicken wings in boiling water to remove blood or any impurities for about 2 to 3 minutes. Drain well. Mix with marinade. Set aside for 15 minutes. Peel and chop the potatoes into large chunks. Soak in water for 5 minutes. Drain well. Set aside. In the same wok, add oil to sauté shallot and ginger until aromatic. 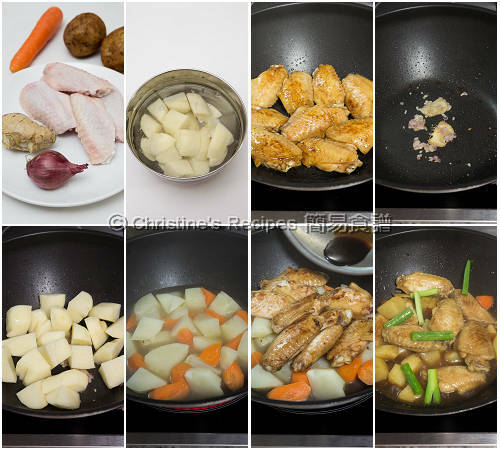 Add potatoes and stir fry for 3 minutes. Add carrot. Stir to combine. Pour in water. Cover and cook until the potatoes turn soft. Toss in the chicken wings. Add the reserved marinade. Cover and cook further 10 minutes. Add the sauce and cook to your preferred consistency. Stir in the spring onion. Serve hot. I used brushed potatoes. The flesh has a rich flavour and holds well together after cooking to be softened. You may use any kind of waxy potato that comes handy to you. By soaking the chopped potatoes in water for a few minutes. The potatoes won’t easily turn mushy after braising. The power of every stove is very different. Please adjust the cooking time and replenish with boiling water if needed. Had been staying Japan for 9 years and learnt the Japanese way of preventing mushy potatoes. Just add a dab of butter when boiling potatoes to keep its shape. It won't affect its taste, but its shape stays fIRM. Perhaps you could try this way. Thanks for your tip, Cindy. Will try it for sure. Thank you for your delicious recipe. a) when do we need to blanch meat? only when there are bones? b) what is the least effort way to blanch the meat? I always dread this step but wonder what is the best way to do it. ii) do you boil the water on the stove with meat for 2 to 3 minutes? 1) If the meat is frozen and thawed, I'll definitely blanch it to remove the frozen smell. If meat with bones and I plan to stew it, definitely blanch it. If the meat is fresh, it all depends on how I use it. Sometimes I brown it on a frying pan first, so I don't blanch it. 2) Quite often I pour boiling water into a pot if I'm in a hurry. As for bones that I use to cook soup, I often put them with cold water before turning on the stove. 3) Blanching time varies and depends on the quantity of the meat/bones. When you see blood and scum float out, it's done. Hi Christine, can I use sweet potatoes as substitute? Thank you. Thanks for this recipe. I tried it and it was definitely a comfort food I will go to. Im fact will be cooking again when my siblings come for dinner tonight. Thanks so much for sharing such a lovely recipe. Glad that you loved this recipe. Happy cooking ! Can i actually use breast meat? Sure, you can use chicken breast instead. I just feel braised meat with bones more delicious. Sometimes I make this dish with chicken thigh with bones too.